The Vought F4U-1 Corsair was one of the greatest combat aircraft in World War II. The prototype was the first US warplane to exceed 400 mph and outperformed all other American aircraft at that time. Some 12,571 Corsairs came off the production line, the last being built in 1952. 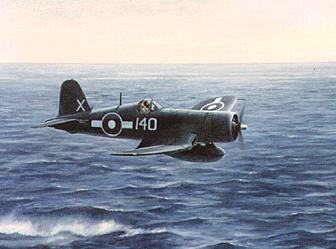 Action with land based American Marine squadrons began in the Solomons in 1943, and from then on the Corsair swiftly gained air supremacy over the previously unchallenged Japanese. The name Corsair has been applied to a succession of United States Navy aircraft through many decades, but none has been more devastating to an enemy than the F4U Corsair, a distinctive 'cranked wing' monoplane fighter. The Corsair's most unique feature was the "bent" wing, the result of a marriage between the most powerful engine ever installed in a piston-engined fighter and one of the biggest propellers in the world. The inverted gull wing permitted the short, sturdy undercarriage required for carrier operations, allowed a low-drag, 90 degree wing-fuselage junction, gave the pilot better visibility over the wing and lowered the overall height of the folded wing. An added asset of the gull wing was a planing action during emergency water landings. Development of the F4U began in 1938, when the US Navy ordered a new carrier-based fighter. The prototype first flew in May 1940, and by February 1943 the aircraft was operational with the US Marine Corps against the Japanese in the Pacific area, flying initially from land bases as the US Navy considered it too fast for carrier operations. This was proved wrong when Corsairs delivered to the Royal Navy were flown from carriers with great success from April 1944. The Corsair's distinctive sound, which earned it among the Japanese the nick-name of "Whistling Death", partly because of the engine noise, was caused by the wing-root inlets for engine air. Inside of these inlets were placed the oil coolers which ejected hot air through adjustable doors under the wings just ahead of the spar. However, to the ears of American G.I.s clawing their painful way off the bloody beaches of Okinawa in April 1945, it was the sweetest sound in the world. In the shadow of their "Sweetheart's" cranked wings they found a brief respite from the danger that threatened them from every palm-grove and every scrub-covered ridge; but it is doubtful if any of them realized that the aeroplane which protected them had at one time been officially a "failure". Armament consisted of six 12.7 mm. Browning M2 machine guns, three in each outer wing panel, normally boresighted to converge at 300 yards. Inboard and intermediate guns carried 400 r.p.g. and outboard guns, limited by wing contours, carried 375 r.p.g. If desired the outboard guns which most affected stability and flutter characteristics, could be removed. The prototype XF4U-1 first flew on 29th March 194 with Lyman A. Bullard at the controls and its impressive speed of 405 m.p.h. gave the lie to the prevalent theories among Army Air Corps authorities that the future of high-speed fighter design lay in the H-3730 and X-1800 liquid-cooled engine projects. Pratt and Whitney were consequently permitted to cancel these latter projects. Ease and speed of mass production had not figured largely in the design as war was not considered imminent; thus a U.S. Navy request of 28th November machine, Bureau of Aeronautics Number (BUNO) 02153, flew on June 25,1942 with a top speed of 415 m.p.h., a sea-level climb rate of 3,120 ft./min. and a service ceiling of 37,000 ft. The first carrier trials were carried out on September 25,1942 aboard the U.S.S. Sangamon (CVE-26) by Lt. Sam Porter in BUNO 02159, the seventh production machine. These trials drew attention to a number of problems which prevented the Corsair from going into carrier service with the U.S.N. for some years. The landing gear shock struts were too stiff; and there was a landing "kick" caused by local stall in the crank of the gull wing in the high three-point attitude. Experienced pilots learned to master this but accidents were numerous during training. The main landing gear legs rotated through 90 degrees as they folded rearward to permit the wheels to lie flat in the wings. The rearward-folding tail-wheel, with the arrester hook attached to the strut, was self-centering, lockable and 360 degree swiveling with a 12 1/2 x 4 1/2 in. pneumatic tire; early models carried an 8 1/2 x 4 in. solid tire. Very early production Corsairs were equipped with the Brownscope wide-angle rear-view periscope system, which was shortly replaced by a mirror in a small "bubble" in the sliding canopy. The first aircraft to be fitted with the blown hood was BUNO 17456, and the first production aircraft was accepted on August 9,1943. The low cabin line and long nose of the early versions made accurate deflection shooting extremely difficult; the sight line was therefore raised 5 in. and the seat adjust increased to 9 in. Due to the urgency of production requirements the rudder pedals were moved aft but raised only 1/2 in. 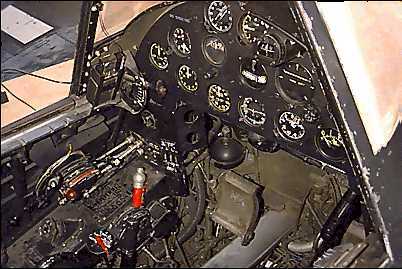 Pilots thus adopted an almost "standing" posture when the seat was at full height and this, coupled with the fact that the Corsair had no cockpit floorboards gave one the impression of sitting on the edge of a deep pit with a yawning black chasm below. The pilot's posture was satisfactory for long flights but the more nervous felt a constant nagging fear that if they slipped they might just wind up somewhere in the mysterious depths of the fuselage bottom ! On February 13,1943 Marine Fighter Squadron 124 (VMF-124) demonstrated their superiority over the Wildcat by escorting PB4Y-1 Liberators all the way to Bougainville. The following day they saw combat for the first time, and the inexperienced Corsair pilots were badly mauled by some 50 Mitsubishi Zeros. Two Corsairs, two Liberators two P-40s and four P-38s were lost in this "Saint Valentines Day Massacre", but the Corsairs soon gained an ascendancy over the Japanese which they never lost, VMF-124 being subsequently credited with 68 kills against a loss of four aircraft and three pilots. Within six months all Pacific-based Marine fighter squadrons had been re-equipped with the Corsair. Essex and Bunker Hill during the first strike on Rabaul. When they ran low on fuel VF-17 became the first squadron to "operate" from a ship in combat. The Corsair achieved a victory/loss ratio of 11-3/1; it proved "definitely superior" in trials with a captured Zero and gave favorable results in competitive maneuvers with a P-51 , a P-47 , a P-38 and a P-39. Above 12,000 ft. the Corsair outfought the Mustang and was considered evenly matched at lower altitudes. Against the F6F (even with Lt.-Cdr. "Butch" O'Hare at the controls of the Hellcat) the Corsair was more than a match for its opponent. The most important naval attack fighter of W.W.II, the Chance Vought Corsair remained in production for thirteen years, In all, about 12,600 Corsairs were built, up to 1952, in many versions ranging from F4U-1 to F4U-6 (AU-1). The Corsair has been credited with over 2,000 enemy airplanes destroyed. Not bad for an aircraft whose service trial, for its chosen role, ended in failure. 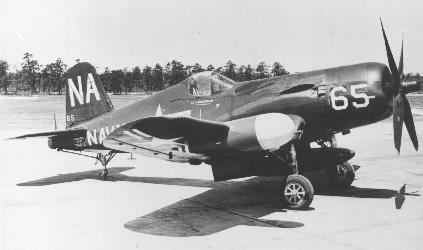 Ten Corsairs were ordered as the F2G-2 with the 3,000 hp Pratt and Whitney Wasp Major R-4360-4 28 cylinder engine. The R-4360 saw service only at the end of the war. This engine was used in late B-29s, which were actually B-50s, and the Convair B-36. The F2G-2 was a naval versions of the F2G-1 with serial numbers 88495/88468 and used as carrier based, low altitude fighters. Maximum speed was 431 mph (694 km/h) at 17,000 ft (5,182 km). Armament consisted of four .50 caliber machine guns with an external bomb load of 3,200 lbs (1,452 kg). After the war, Corsairs continued flying with several air forces, and became the final piston engined fighters built in the United States. When the Korean War started in 1950, Corsairs were again used by the US Marines for ground attack. Others supplied to the French Navy, in Indochina, remained in service until 1964. They continued to serve in Honduras, El Salvador and Argentina. Not until the mid-seventies did the last South American country finally withdraw the type from service. Manufacturer: Chance - Vought Aircraft Corp.
Max. speed: 425 mph @ 20,000 ft.